Cycling enthusiasts, are you out there? 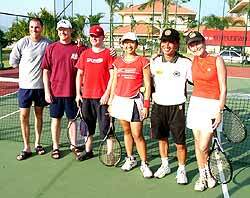 The American consulate Chiang Mai held a fun tennis tournament for friends, tennis lovers and people not scared of the heat. The ‘qualifying matches’ were held on Saturday, November 9, with the finals on the following day. The first qualifying match between Trucker Dan and David from AUA against the team of Tom LeDoux and David LaPrade began at an unsociable 7 a.m., with Trucker and David winning the best of three sets 4:6, 6:4, 6:2. Just for staying 3 hours on the court all the players deserved a trophy. Henry presenting Chai and Lindy with theirs. The next round started at 9.30 a.m., still almost cool outside, with APIS Headmaster Barry Sutherland and his wife against the unstoppable Linda and Chai Santitharangkul from the US Consulate with Lindy and Chai victorious. The day started to heat up and despite an all American ‘BBQ for athletes’, containing lots of hamburgers, salsa, corn chips, hot dogs and plenty of health food like cool beers, the second round of qualifying started. Consul Henry Jardine and Randy Jennings from the US Consulate were pitted against Michael and Marion Vogt from Chiangmai Mail. Unafraid of ‘bad press’, Henry and Randy slaughtered their local newspaper but were kind enough to let them get one point, the match ending 6:0, 6:1. Umpires and winners together after an almost 3 hour final match (from left) Trucker, Henry Jardine, James, Gai, Chai and Lindy. The last qualifying match saw George Kent from the embassy in Bangkok with Joy from Payap University bowing out under the pressure from Gai from Bake and Bite with her tennis partner James from AUA 2:6, 6:4, 6:4. The semi-finals and finals on Sunday put a lot of pressure on the players and especially the umpires. The finals ended up as a marathon match between Lindy and Chai versus Gai and James. The active and motivated duo Lindy and Chai during the tiebreak in the final. After two sets, it was one set all, and with the sun blazing down they walked onto the court for the decider. Neither could break the other, despite the hard hitting returns from James and Lindy’s highballs (tennis, the others came later) so that it ended up in a tie-break eventually won by Lindy and Chai (7:5) after 3 hot hours on the court. The cup was presented to the winners by Consul Henry Jardine, the tireless, but hot umpire, after which everyone retired to party on. The Morning Star Athletics to Olympics competition in the northern region ended successfully with athletes from the Sports Training School in Lampang winning the overall trophy in both men and women’s teams. In the 15-18 years old categories, the men’s team from Boonyawat Wittayalai School from Lampang grabbed the overall prize with the women’s team competition going to Phitsanulok. The cheerleader team from Kavila Wittayalai School, Chiang Mai bounced their way to the winning trophy, following by Wattanothai Payap and Dara Academy, Chiang Mai. The event was held at the Chiang Mai 700 Years Sports Complex with Sakol Pongputtakul, Chiang Mai Provincial Sports Association president presiding over the closing ceremony and awarding the prizes to the winners from 15 provinces and 58 schools all over the northern region. There were 839 athletes who participated in the Morning Star Athletics to Olympics. All athletes who ranked higher than sixth place in track sports and higher than third place in field sports will represent the northern region to compete in the Morning Star Athletics to Olympics final round, Zone 5 at Thammasat University Sports Complex, Rangsit Center in Bangkok on January 18-21, next year. In and around Mae Rim, just north of Chiang Mai, is a road and mountain bike paradise. With the rice crop maturing in this agriculturally lush area, the green fields of the rainy season are turning golden brown and bristling with harvest and re-planting activity and the air of prosperity of the season. 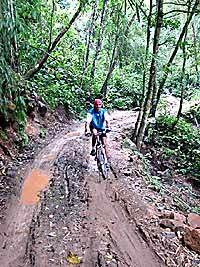 There is a bike ride for everyone, from all day “tour de Samoeng” mountain highway grinds, to half-day combination road and mountain bike routes, to short one or two hour scenic jaunts. Six of the eleven routes mapped in Pete Devakul’s book “Fun & Genuine Mountain Bicycling - Biking on Your Own” can be approached from Mae Rim. Getting there is half the fun! There are three primary routes to cycle to Mae Rim from Chiang Mai. The most direct is highway 107 that leads straight out of town from the center of Chiang Mai; Mae Rim town is about 12 kilometers from the superhighway. From the east side of Chiang Mai there is a winding scenic route along the Ping River. Follow the Faham Road on the east side of the river, cross under the superhighway and continue north to Sanpeesua. Five km north of the superhighway you cross under the 2nd ring road and continue north along the river through some really pretty farm country. At about 3 km past the 2nd ring road you cross over the new 3rd ring road (121) 2 1/2 km more and you reach a major overpass and bridge over the river; this is the Mae Jo - Mae Rim Road (1260). Cross the bridge and cycle one kilometer to the main highway (107), turn right into Mae Rim town. Another route north from the west side of Chiang Mai is along the irrigation canal road. At about 7 km north of Huai Kaew Road, pass the entrance to Huai Tueng Thao Park, curve right and catch the highway 107 for a while. (You cannot follow the irrigation canal road all the way, unless you want to try and outrun military personnel.) Going north along the highway pass the “Pack Squadron” and “5th Special Forces Regiment”. Right after the big guard gate, take the 45-degree left turn along the irrigation canal. From here you can fly into Mae Rim on new, smooth paved road. At the intersection near Wat Pa Darapirom you can turn right into Mae Rim town or left toward the Regent Resort, Highway 1096 and Mae Sa Valley. Now you are in the heart of Mae Rim. From here you have a choice of routes; I will refer to those which are mapped in Pete Devakul’s book mentioned above. Route 1 is a major mountain climb for serious road cycling. It takes you on a big loop, circling the Doi Suthep - Pui National Park, up the Mae Sa Valley on Highway 1096 to Samoeng and down toward Hang Dong on Highway 1269. Route 9, a 22 km loop, is a fairly flat and easy road bike route through villages and farmland, with stretches along the Ping and Mae Rim rivers. 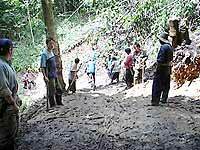 Route 10 is in the same general area as Route 9 (northwest of Mae Rim town) but includes some mountain bike terrain. Routes 2, 3 and 11 start from Highway 1096 in the area of Pong Yaeng Nok village. These are big loops with serious hill climbs, 2 and 3 are for mountain bikes only. M.L. Chititewan Pete Devakul’s book, as well as GPS equipment, bikes, parts and repairs, are available at Top Gear Bike Shop (at the bend in the middle of Chang Moi Road, near Soi 2). Every Wednesday and Saturday some cycling enthusiasts meet to enjoy off road, downhill, jungle tracks, and forest tracks in the area around Chiang Mai. They go to explore waterfalls, rivers, even dirt roads, and would love to welcome more people in their group. If you are a bicycle rider, love fun, adventure and get to know new friends, get in touch with Aidan from the Rose Guest House (01 024 7046) or with Thierry (06 915 5319). The meeting point is as always the Rose Guest House, who even rents out their bike if you don’t have one (yet) by yourself. The tours are between 10 km and 30 km long, depending on roads, mood, athletic condition and weather. There were an awful lot of smiling faces at the Gymkhana Club on Sunday November 8 - and that was just the coaches! For the first time in the history of cricket in Northern Thailand, trials were held for the selection of boys to play for the national side. After a good day on the pitch, the youthful group and coaches gather for a group photo. Mohideen A. Kader, a Southern Thailand coach and Thailand selector, paid a visit to observe the standard of the boys, with a view to selection for the U15 and U13 national side. Another first was the competitive game that was played. This involved boys from Chiang Mai and surrounding districts. After this session individual coaching was given to boys short-listed for selection. Two of these boys, Suranya Janai and Jirayu Suwanna, who have been selected for the U15 side, will continue to be coached on a one to one basis. CMSCA Senior coach, David Buck explains running between the wickets techniques. Various coaching aids were used, including video analysis, which showed the boys ways to improve their game. None of this would have been possible without the tremendous amount of work carried out by Eric Little and this team of coaches. The Chiang Mai Schools Cricket Alliance has now recruited an England Coaching Board Level III Coach, David Buck, who will take the game a stage further here in Northern Thailand. The Veterans Tennis Association (Thailand) will play host this year to the Asian Inter-City Veterans Team Tennis tournament, which will be held at the 700th Year Sport Complex. The tournament will be from November 25 until November 28, from 8 a.m. - 4 p.m. It is the first time in the history of Thailand where more than 200 veteran tennis players from all over Asia will take part in this tournament, which has been staged for the past 17 years, and each country takes a turn in hosting that event. Invitations were sent to 8 countries in Asia which comprises of 12 teams. The teams are Beijing, Shenzhen, Shanghai, Macao, Hong Kong, Tokyo, Osaka, Taipei, Jakarta, Bandung, Philippines, Singapore and Korea. Thailand as the host country will send 2 teams this year. The age of the participants are: men: 50 - 70 years and women: 50 - 55 years. The strong Thai team has so far won 6 times including the last time in Shenzhen, China in November 2002. Judging from the number of players which participate regularly in this event and the number of ‘newcomers’, it is assumed that the future of veterans tennis in Asia looks very bright. If you would like to know more, please contact Somrak, tel. 09 894 3724. The public relations officer of the 700 Year Sports complex has informed Chiangmai Mail that the stadium has basic level tae-kwan-do courses and all applicants will immediately get a free sports coupon valued 100 baht. This offer runs until November 30. The self-defense course runs Monday-Thursday from 5.30 - 7 p.m. and at the weekends. The course service charge is 800 baht per month per person. The training will be held at the 700 Year Stadium dormitory building with a rubber floor which meets international competition and safety standards. More details and enrollment can be arranged at the swimming pool building in the Chiang Mai 700 years stadium every day from 8.30 a.m. - 8 p.m. tel. 053 210 825. Last Monday afternoon, Prem’s junior soccer teams played their first games of the season against Lanna International School. 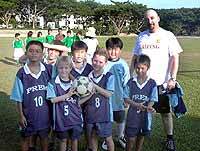 Prem’s Grade 3/4 team won 3-1 with Sean scoring all 3 goals for the winning side. The Prem Grade 5/6 team who ended up drawing 3:3 against LIST. Prem’s Grade 5/6 team faced tough competition and ended up drawing 3-3. David (Prem), Matthew (Prem) and Nopadon (Prem) all scored goals. However, the highlight of the afternoon was undoubtedly the K-2 game. There was much running about, laughing, and general enjoyment as the youngest soccer players took to the field. Prem’s K-2 team beat Lanna 5-2. Smart (Prem) scored an impressive 3 goals and Sonny (Prem) scored 2 goals. The K-2 soccer team with their coaches, Simon and Sioban. They might not have played the most organized or skillful soccer game, but Prem and Lanna’s K-2 teams definitely won the prize for cuteness! Are they importing the sand? Chalermsak Suranant, Tourism Authority of Thailand (TAT), Northern Office director revealed that the TAT has announced its support for the 5th Queen of the Desert car rally which is being organized by their Rome Office together with the Geographical Tour Company to open up the tourist market in Israel for travel to Thailand. The rally will be held from November 11-18, with the route covering Chiang Rai-Chiang Mai-Mae Hong Son. The first event was held in Israel, then switched to neighboring countries. This year the rally is being held in the northern region of Chiang Rai, Chiang Mai and Mae Hong Son provinces to promote natural tourism spots and scenic routes. It is expected that the overseas media will be attending which is a great opportunity for Thailand to publicize tourism routes and tourist attractions in the northern region to the world. For more information contact the TAT, Northern Region, telephone 053-248604 - 7. The Tourism Authority of Thailand, Chiang Mai Office will once again be one of the main sponsors to support the Chiang Mai Bike Week 2003. The Chiang Mai Bike week will help to support Anti Drug activities as well as children affected by AIDS parents and will as always try to bring a little bit of joy for people less fortunate. The CMBW will include a procession caravan through Chiang Mai on the morning of Sunday, December 7, with approx 300 bikes in persuasion of the projects: ‘Ride With Helmet’ and ‘Drunk, Don’t Ride’. On December 7 there will also be a caravan charity ride, “Fai Hai loop” to Prao District, where needy children and students will receive gifts and presents. The official main party will be at the beer garden of the Imperial Mae Ping Hotel this year and will include a Fun Fair with 20 booths of shops and motorbike groups, a BMX biking show on obstacles, a ‘Ride & Bite’ competition, a motorbike contest, a prize for the best custom bike, the best touring bike, and the best sport bike. Three Pop Rock bands will entertain the bikers and guests, including Khun Tuk, better known as the ‘Bob Marley of Thailand, from the Brasserie who will be the highlight in the main event. People who want to take part in the CMBW 2003 can get in touch with Ratanapong Reugkasem (Lek) from the North Comets.